I am a 20 year member of SABR. 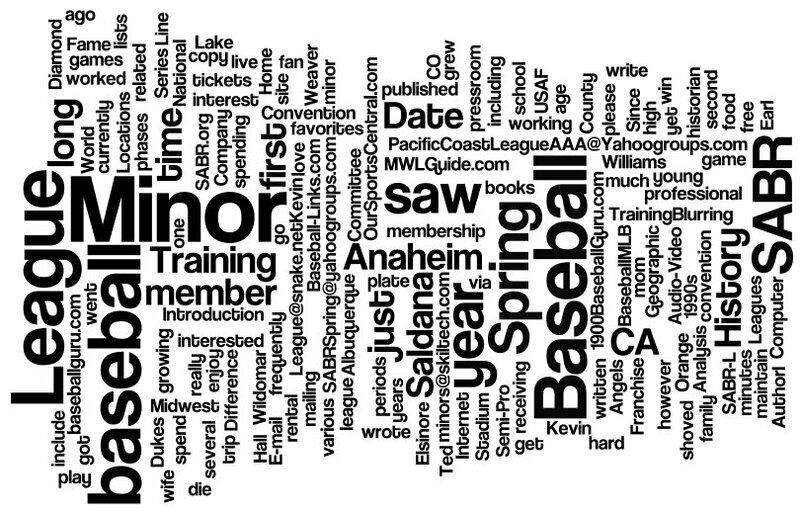 A year ago I started the Spring Training Committee for SABR. I am currently working for an Audio-Video, Computer rental Company. I am a very die hard fan of the Anaheim Angels and have been for 32 years. Did they really go to and win the World Series this year!! I grew up in Orange County, CA. When I was young, before I was in high school, my mom worked in the pressroom at Anaheim Stadium. She frequently got us free tickets to the games. Earl Weaver once shoved a plate of food at her. I do however maintain an interest as a historian in all phases of professional baseball. I saw my first minor league baseball game at the age of 20, when as a member of the USAF I went and saw the Albuquerque Dukes play. I once saw Ted Williams at the Baseball Hall of Fame. I have written several books but, have yet to get any of them published. 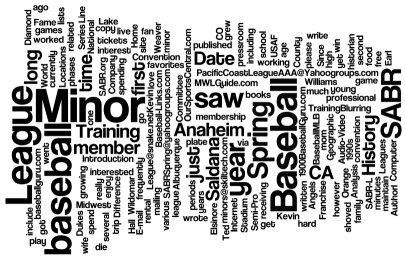 My first book was "This Date in Minor League Baseball History", my second "Minor League Baseball in the 1990s" and then I wrote "This Date in Geographic History". Any one interested in receiving a copy via E-mail please write. My wife and I live with our growing family in Wildomar, CA (just 10 minutes from the Diamond @ Lake Elsinore).